Grille Doors provide security and visibility. Commonly used in retail and other commercial applications, including secured parking areas, rolling and folding grille doors are the perfect solution against theft and vandalism. They are constructed with security, simple and high cycle use in mind. Folding Grille Doors are designed to fold horizontally and store behind or next to the door jamb wall. They come in a variety of designs and are built for security and visibility. Rolling Grilles operate in a similar fashion to roll-up doors. 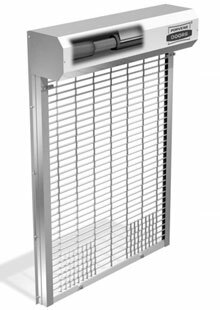 Our grille doors are designed to operate easily and quietly while providing the utmost in security. At McKinley, we service, install and sell all types of grille doors. Call today to discuss your product or service needs with one of our experts.